One has to wonder if Betsy DeVos has taken over the Department of Education’s Twitter account, because someone just used a W.E.B. 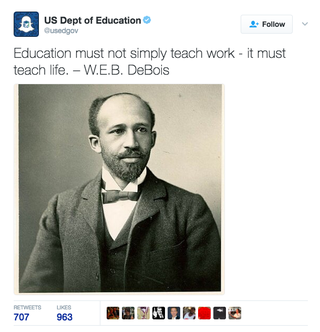 Du Bois quote but attributed it to some dude named W.E.B. DeBois. Now, before you go and blame an intern, nowadays most social media is actually run by full-time staff at government agencies. Maybe the social media person had a rough Saturday night?